In 1981, the government announced its intention to form a second public bus company in order to compete with SBS(1978) on an equal footing. Singapore Shuttle Buses was granted the license in 1982, and Trans-Island Bus Services came into being in 1983, and operated 37 buses on service 160 and 167. Japanese Hinos were operated. TIBS moved into its present HQ in Ang Mo Kio in 1986. It was also publicly listed on the local SESDAQ index in 1987. Most of the original Japanese buses were progressively phased out in the 1990s, and were replaced by more modern city buses. 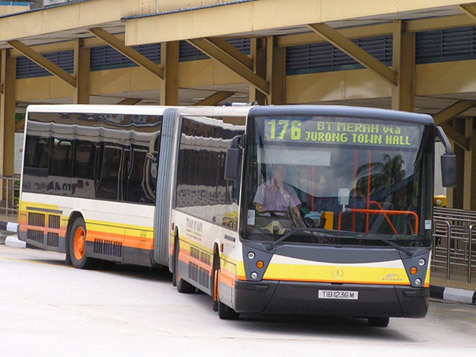 It also introduced the popular articulated bus, affectionately known as the Bendy bus, in 1996. TIBS now operates services mainly in the North and North-west district of Singapore from 5 interchanges and 2 terminals. It will also operate services in the upcoming Simpang residential area. TIBS was brought under SMRT Corp in 2001.
! !Note: We aim to preserve the authenticity of the images in this website. No organisations / person(s) is allowed to reproduce the images in any retrieval deivice or print for commercial reasons.